Watermarking photos before sharing them on Facebook can turn out to be a truly beneficial step. Foremost, it’s a great way to protect your photos. Many Facebook users copy and use other users’ original photos on their profile or website without giving the proper credit. By inserting a watermark you publicly claim the rights to those pictures and that they can’t be used elsewhere online without your prior permission. Besides protection, let’s not forget that there’s also a marketing side to watermarking images. By adding your logo or signature to high-quality photos you get to benefit from more exposure, reach new audiences and get them to visit your company website or blog. 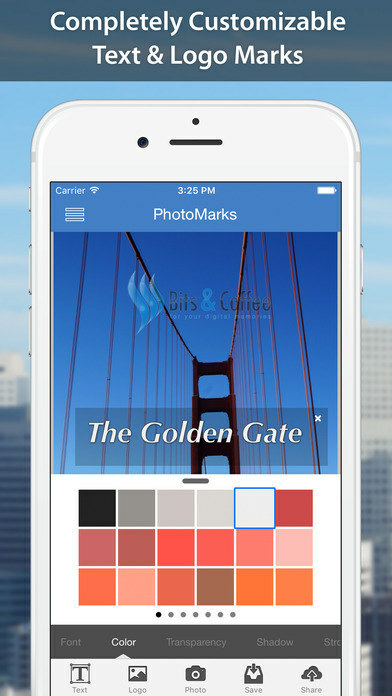 PhotoMarks is a watermark app for iPhone designed to be quite easy to use thanks to the intuitive interface. With this app you can add text and logo marks to your Facebook photos and customize them to suit your preferences with just a couple of taps. For that purpose you can position, rotate and scale your marks how you want, adjust the transparency, change the size, font or color, as well as apply special effects like shadow, stroke or bounding box. PhotoMarks lets you add multiple layers of text and logo marks and offers undo and redo support throughout the entire editing process. Truly useful is the fact that you can save your watermarks as profiles and simply load them later in another session, to save both time and energy. Once you’ve added the finishing touches, the app allows you to save and share your photos on Facebook and other social networks or send them via email. If you don’t have a personal logo by now, Logo Maker is definitely worth trying. With this app you have the opportunity to design and add your own logo to photos in a fast manner, with just a couple of taps. Logo Maker places at your disposal a huge collection of graphic elements, shapes, textures, fonts and backgrounds, which you can mix as you wish in order to create a professional-looking logo for your business. The app gives you multiple options to edit your images and your text, such as flip, resize, rotate them or change the hue. Additionally you can use this app to design various promotional materials for your business, like flyers, posters, brochures or newsletters. 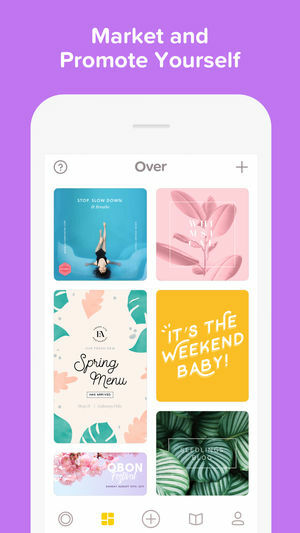 Over is not a standard watermark app, but was rather designed to make your visual content stand out on social media. The app places at your disposal a wide array of graphic design elements and templates to create eye-catching content on social networks, as well as the opportunity to protect and brand that content through watermarking. With Over you can add text and logo watermarks to your pictures with ease and edit them to meet your requirements. You can choose the exact placement and scale, select from an impressive variety of fonts and colors, drop a shadow for a distinct look and many more. 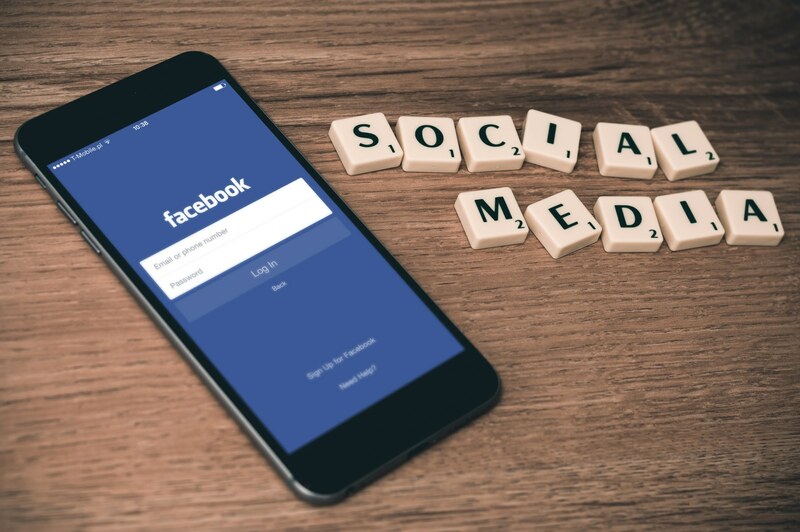 When you’ve finished creating and branding your content, the app lets you directly upload it to Facebook, Instagram, Twitter and other networks. 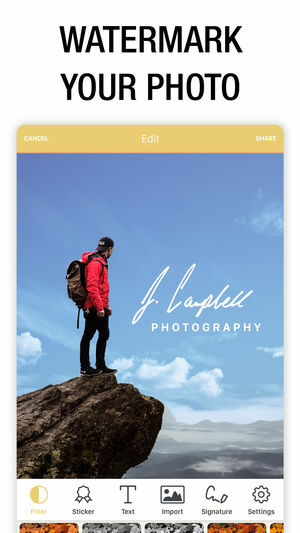 Watermark Studio X offers users a large database of pre-designed watermark templates to quickly protect and brand their photos on social media. The watermarking options are quite numerous and include a copyright notice, digital signature, logo, location or even a modern hashtag. Once you apply your desired mark, you can then start making adjustments. The app allows you to select the preferred placement and size, to change the font and color or to set the opacity. When you’re done you can share the photo directly from within the app on Facebook or other platforms. 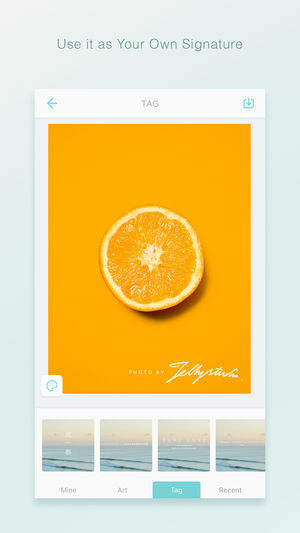 InstaLogo is a cool and easy-to-use logo maker app for iPhone. This app comes packed with a vast library of logos and lets you customize them by choosing the desired position and rotation, selecting from a wide range of fonts, changing size and perspective and more. At the same time InstaLogo allows you to import an already existing logo and adjust it to your liking. This means you can modify the gradient and color, text, background, use grid lines for perfect alignment or move elements by degree. You can also delete certain parts of the logo and undo and redo every action during the editing process. Developed by the same company who created Camera 360, My Watermarks is an interesting alternative to watermark photos on the go. The app enables you to turn any object or item into a logo, as long as it’s on a transparent background, and to make all the necessary adjustments to it for a professional look. With My Watermarks you can also add your own signature to photos. All you have to do is use the camera to take a picture of your handwriting on a blank paper. Then you can easily apply the signature to any picture on your iPhone and customize it to find the perfect look, placement and size. Watermark Photo makes it easy to protect, as well as market your original work. 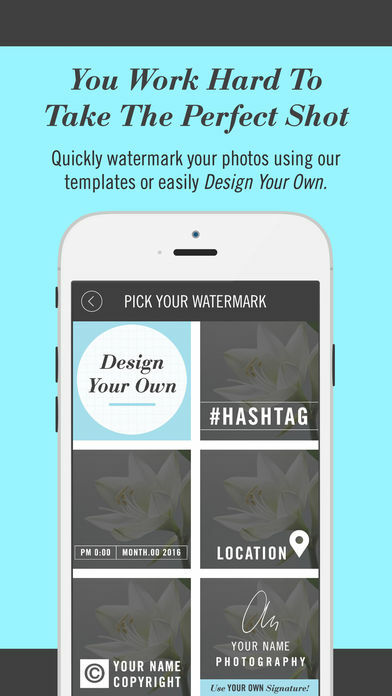 This iPhone app enables you to import your own watermark or just create one on the go. For that purpose the app offers you more than a thousand graphic elements, ranging from stickers and badges to numerous colors and fonts. With Watermark Photo you can add a logo, copyright sign, text or a signature to your pictures. Of course, the app lets you customize the watermarks and directly share the resulting images on all major social media platforms. One important thing that’s missing is the possibility to save your watermarks as templates for later use. Do you use watermark apps to ensure Facebook photo protection? Which is your favorite? Let us know in the comments below.